Snowbee Neoprene gloves, made in soft 2.5mm Neoprene to keep you warm on the coldest days. Material panels run down each side of the gloves & between the fingers to provide added flexibility and comfort. The back of the Neoprene gloves has a jersey knit lining, whilst the palms and fingers use a patterned rubber for extra grip. The glove thumb, index and middle fingers have 'flip-up' tips, with Velcro pads to hold them back so left exposed will allow tying of knots, loading, etc. without the need to remove the gloves. The last feature of these gloves is its Velcro adjustable wrist cuff to help keep you snug and warm. 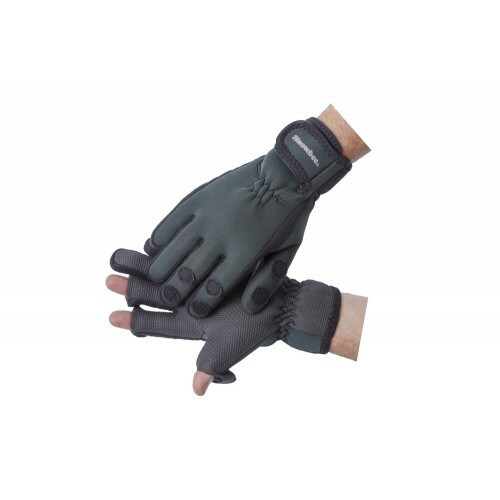 Snowbee Neoprene gloves come in a choice of five sizes; S, M, L, XL and dark green with a black palm.